RakasaFit is typically a 60-minute workout consisting of seven combinations, starting with a warm up, and finishing with a deep cool-down stretch. Each combination drills one essential belly dance shape, explored through the dynamics of feet positioning, arms, levels, speed changes, or traveling. In addition, most RakasaFit combinations include drills that are typical across fitness styles, such as lunges/squats, knee lifts, cross-lateral reaches, and more. These reinforce the muscles being engaged and boost the workout to aerobic intensity. For deeper format specifics and and videos with sample routines and combinations, log into your membership account or enroll here. Your first 7 days are free and you may cancel anytime. In RakasaFit, belly dance moves are structured according to shape, dimension, and direction. The basic shapes we embody are the universal circles, waves, lines, and vibrations reflected in our universe. This sets the moves into a tangible structure for faster learning. Beginners may not execute correctly at first, but their minds can retain a clear visual reference which guides their bodies toward proficiency with repetition. This page lists the essential belly dance shapes and moves accordingly, and how they are implemented into the RakasaFit workout. Specific combos and routines are available for RakasaFit subscribers. Hip Lifts (and Drops): We engage the power muscles of the thighs (adductors and gluts), squeezing and contracting to lift each hip up. Because of the natural curve of our bodies, this may appear as a simple swing of the hips, however internally we must visualize engaging our thigh muscles to create a straight vertical line up. And what goes up on one side goes down on the other, thus a lift on one hip creates the appearance of a drop on the other. Because the technique of hip lifts -- engaging power muscles in the thighs to create movement -- is so fundamental to all of belly dance, hip lift & drop combinations are usually first in the RakasaFit workout, to get the body and mind warmed up for the rest of the belly dance moves and work towards our cardio peak. Therefore, this RakasaFit combination can be exclusively belly dance and does not need to include a fitness pattern. This combination will always include variations on flat feet, balls of feet, and each side, in addition to other possible dynamics. Hip Circles (Exterior / Interior): Circles are the most prevalent shape in belly dance, and can be created with all parts of the body. When circles from each side are combined, this makes the shape of an 8, which we refer to separately as “Figure 8s,” but they are in fact in the same family. Exterior hip circles are traced as big external circles around the outside of the feet, which are often positioned shoulder-width apart. This requires reaching well outside of your center with the hips, and involves no hip/pelvic rotation. In contrast, interior hip circles are centered directly over the feet and require deep, full, and symmetrical rotation of the hips by engaging the power muscles in the thighs. These are common across a variety of world dance forms, including Hula, Tahitian, Samba, and African. In belly dance this move is referred to as “Omi.” In RakasaFit, the exterior hip circle combination comes early in the workout. The omi combination is usually last due to its intensity and more compound use of muscle dynamics. Both combinations involve a fitness pattern. Undulations (Top-Down / Bottom-Up): An undulation is a wave in the shape of an “S” in the vertical dimension, moving in the direction of top-down (starting from the chest) or bottom-up (starting from the pelvis). Both require extending throughout the spine, starting or finishing (depending on direction) with the chest ahead of center. In Egyptian belly dance, "camel walks" are a common application of top-down undulations. Undulations can also be done without the spine using abdominal muscles only, as in a "belly roll." It's best to train in both types. Quality undulations are demanding, thus undulation combinations in RakasaFit are toward the middle of the workout, where cardio intensity is high. A top-down undulation combination is an essential in every RakasaFit workout. Most workouts also include a bottom-up undulation combination, but this can be deferred if needed to make room for other combinations. 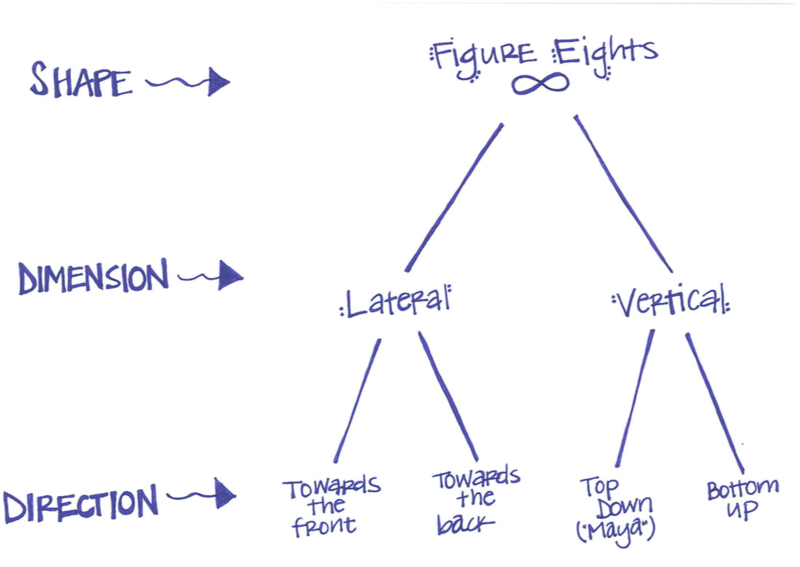 Figure 8s (Vertical / Lateral): Figure 8s are actually two circles connected side-by-side, and many figure 8 combinations integrate some circle repetitions on the same side before looping into the opposite side and connecting the 8. Like circles, the figure 8 shape can be created with all parts of the body. In RakasaFit, we do figure 8s mostly with hips through two dimensions — vertical and lateral/horizontal. With each dimension, there are two directions. In the vertical dimension, the direction moves from top-to-bottom or bottom-to-top, reaching the hips outside of center and then rejoining in the center to loop into the opposite side. The top-to-bottom move is widely referred to as the “Maya” in belly dance. In the horizontal dimension, figure 8s are traced from front-to-back or back-to-front. In this dimension, it is particularly useful to observe the “X” within the figure 8 shape — eliminate the curves of each side and that is what you have left. Twisting your hips to mark these points defines the starting positions for each direction. Shimmies/Vibrations: The shape of a shimmy is vibration, the most essential element of the universe, which conveys all energy, sound, and light. Shimmies are distinguished from all other belly dance moves because they involve no muscle engagement or contraction. To the contrary, hip shimmies require completely releasing all thigh muscles to achieve maximum vibration. Shoulder shimmies are also common in belly dance. In RakasaFit, shimmies are the wild card. There is no combination dedicated to shimmies, yet they can be sprinkled into any combination and also appear throughout the workout as transitional moments between combinations. This maintains the workout intensity while helping to reground and refresh the muscles used in the combinations. For additional breakdown and training, access to the online program! Artwork by Amber Swanger. © 2018, all rights reserved.